As from a certain size of boat, you will begin to notice that a crew communication system on board might come in handy. The distance between you and your partner or friends and family is getting to big to just talk normally. The person at the helm is maybe 10 meters (33') behind the person on the bow and the wind is blowing against the helmsman... not easy! Parking the boat: Whether you go for a Scandinavian or Mediterranean mooring or just go side-to, it's very handy to speak at normal voice level and give commands to your crew. They can give you feedback too, since you can't see and be everywhere. Anchoring the boat: When you're getting close to your anchorage, the crew on the bow can give you directions where to go and which spot is best to drop anchor. Once you're there, you give the command to prepare anchor, give the 'go' to drop and you say how many chain you want to let out. The person handling the anchor and windlass can give you information too. Boat repairs: Sometimes you have to crawl in a small area to service something and you need another person to do an action somewhere else onboard. The job will be done much quicker! Indeed, it's wireless and it has a duplex channel, which means you can speak and listen at the same time. You don't have to push a button to speak, it's totally hands free! You just switch it on and there you go. You talk as if the other person is standing next to you, although he or she is maybe 20 meters (66') standing away from you! Eartec manufactures also systems that allows more people to communicate. Me and Magdalena use the Captain to Mate system. There's choice between different kinds of headsets, whichever one you prefer! I found this system fantastic and I definitely recommend this to anyone! 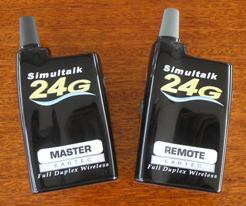 You can even use it away from your boat, when you need communication in another hobby or job to do!